There are roughly 3,000 Christians detained in Eritrea, many of whom were arrested during religious gatherings or whilst praying in their private homes. For Jehovah’s Witnesses, in April 2014 alone, over 90 worshipers were imprisoned during a religious ceremony; they were aged between 16 months to 85 years and older. 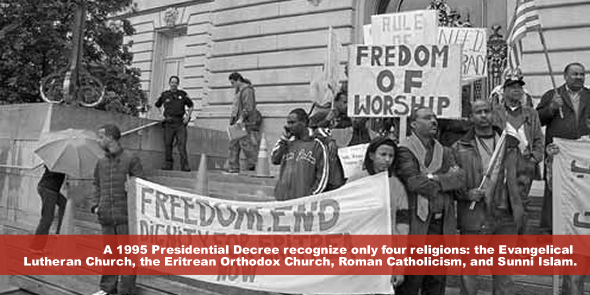 To date, those arrested and imprisoned for their faith in Eritrea have not been officially charged or sentenced; they are not told the reasons and length of their incarceration, nor are there any means for them to challenge its legality. The right to one’s religion is the cornerstone of personal freedoms; simply put – it is sacred. It is enshrined in the International Covenant on Civil and Political Rights as a fundamental human right (Article 8). Religion also plays a social role of linking members of a community together. So, when citizens are denied identity cards or forced to renounce their religions because they exercised their human right to religious freedom, this begs the question: what does the notion of ‘social justice’ really mean in Eritrea? Yet, all that social justice promises I see in the Eritrean people. From those as young as 15 years old leaving their homes and families – fleeing to countries where they can enjoy their human rights to escape indefinite national service, to a mother who battles fear as she holds her child close on a rickety boat across the Mediterranean Sea in search of a life where justice prevails; all the Eritrean people seek is a just society. There are no guarantees for any of them as they deal with uncertainties of perilous journeys which can result in death. But one important lesson can be learned – you can suppress someone’s right to self-expression, you can detain their bodies, but you cannot imprison their minds or dreams for social justice. For as long as the mind believes in, or knows that rights are fundamental – we too cannot allow ourselves to forget them. The UN General Assembly proclaimed 20 February as World Day of Social Justice in 2007. Observance of the World Day of Social Justice should support efforts of the international community in poverty eradication, the promotion of full employment and decent work, gender equity and access to social well-being and justice for all. About the Author: Thato Motaung is a researcher in the fields of gender, peace and security and human rights on the African continent. Prior to working for the Centre, she was a Research Fellow to the African Union Commission, Bureau of the Chairperson in Addis Ababa, Ethiopia. She holds a Master of Science in European Studies: Transnational and Global Perspectives from the K.U. Leuven in Belgium, and a Bachelor of Science in Political Studies & Industrial and Economic Sociology from Rhodes University, Grahamstown.